The three inhabitants of the International Space Station wrapped up a week-long series of eye checks for the Ocular Health study today and continued a litany of ongoing public and commercial microgravity science research. NASA astronaut Scott Kelly worked inside the Destiny laboratory and opened up the Fluids Integrated Rack to replace a microscope lamp. The rack enables numerous fluid physics experiments helping scientists learn how to do such things as design better fuel tanks and water systems aboard spacecraft. Cosmonauts Gennady Padalka and Mikhail Kornienko worked on their set of Russian science exploring the effects of microgravity on the human body and the behavior of liquid crystals. 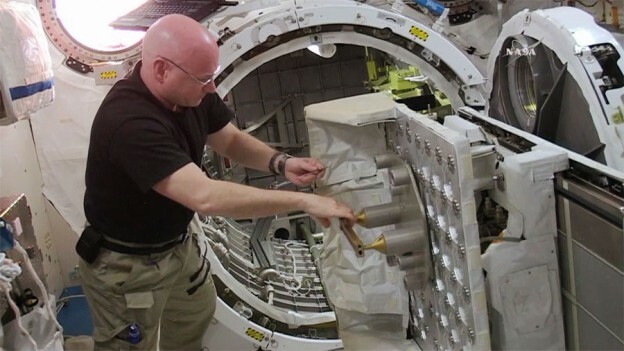 The Splanh experiment looks at how living in space affects a crew member’s gastroenterology. Another study, the OASIS experiment, is researching the possibility of liquid crystal displays inside future spacesuit helmets. SpaceX has rescheduled its launch of the Falcon 9 rocket with its Dragon resupply ship to June 28 at 10:21 a.m. EDT. Padalka and Kelly continue to train for its arrival now set for June 30 at around 7 a.m.
ISS043E257296 (05/26/2015) — Sparkling cities below the International Space Station are haloed by an aurora on the Earth’s horizon on May 26, 2015. The International Space Station got an orbital boost this morning after a docked Russian resupply craft fired its engines for four minutes and eight seconds. One more reboost is scheduled for July 10 when the station will be at the proper altitude for a new Soyuz crew to dock at the end of July. The crew onboard the orbital laboratory conducted a wide array of experiments today looking at such things as radiation, liquid crystals and life science. The trio of station residents also continued more eye checks with assistance from specialists on the ground. 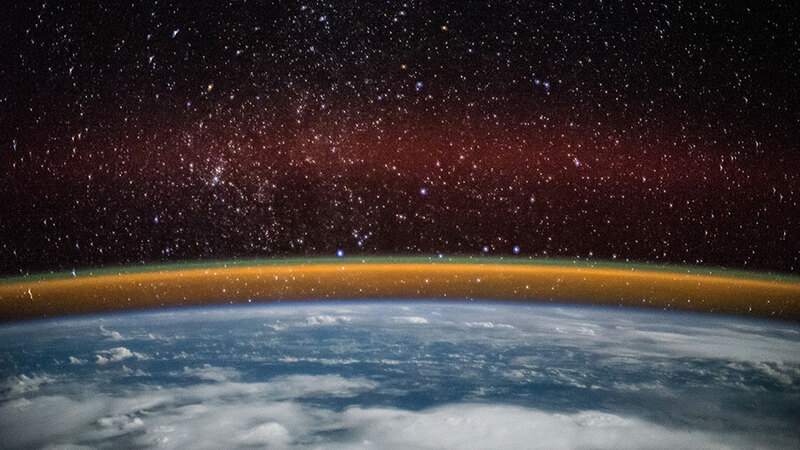 One-Year crew member Mikhail Kornienko participated in the Matroyshka and RADI-N studies monitoring space radiation and exploring how it affects station crew members. Commander Gennady Padalka explored the behavior of liquid crystals in microgravity for the OASIS experiment with results potentially benefitting future space helmets with small display screens. NASA astronaut Scott Kelly worked in the Microgravity Science Glovebox cleaning up after earlier work with the Rodent Research study. NASA astronaut Kjell Lindgren, Japanese astronaut Kimiya Yui and Roscosmos cosmonaut Oleg Kononenko are the next crew preparing to launch to the space station and join Expedition 44. 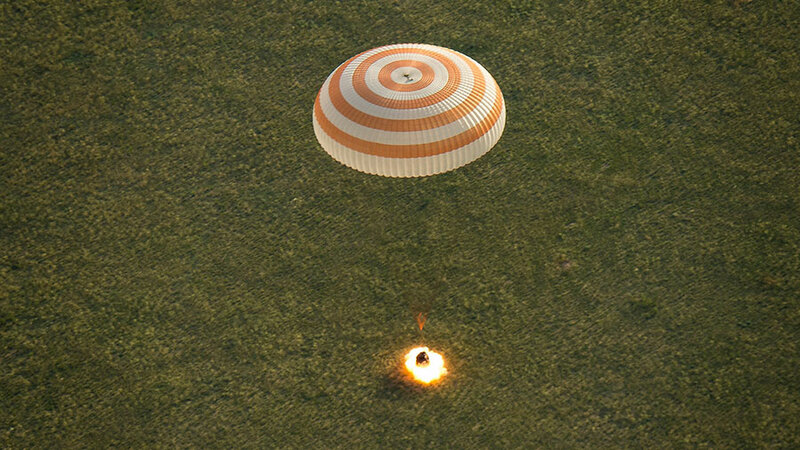 Their launch aboard a Soyuz TMA-17M spacecraft is planned for July 22 when they will take a six-hour ride to their new home in space. The three-member Expedition 44 crew is conducting biomedical science today to study the effects of living in space on a crew member’s body. The International Space Station will raise its orbit tomorrow to allow another trio of space residents to join the orbiting residents at the end of July. Commander Gennady Padalka and One-Year crew members Scott Kelly and Mikhail Kornienko took part in the Ocular Health study today. They looked at the interior of each other’s eyes with a tonometer and checked their blood pressure. Scientists are exploring how microgravity affects an astronaut’s vision and the eye’s physiology. 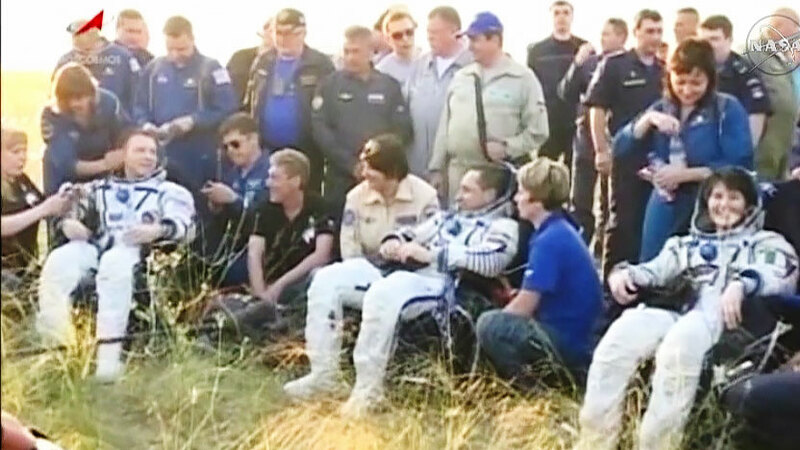 Back on Earth, astronauts from the U.S., Russia and Japan are counting down to their July 22 lift-off on a Soyuz TMA-17M spacecraft to join Expedition 44. The docked ISS Progress 58 spacecraft will fire its engines Thursday morning staging the space station for the new crew’s arrival. ISS042E037847 (12/15/2014) — Astronaut Samantha Cristoforetti captured this image while on the International Space Station. It shows cloud cover over England, Baltic Sea and the Persian Gulf. SpaceX engineers are in the final weeks of processing of the Falcon 9 rocket that will launch their Dragon commercial cargo craft to the International Space Station late next week. On orbit, a pair of Expedition 44 crew members reviewed the procedures they will use when the Dragon supply ship arrives a few days later. 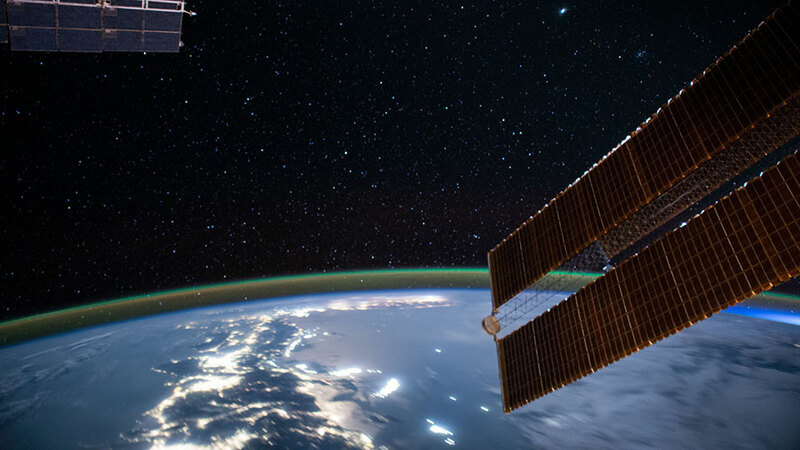 During ongoing orbital station maintenance today, advanced microgravity science took place as the orbiting trio continues to explore phenomena that can only be observed in space. The crew researched acoustic methods to locate micrometeoroid impacts on the station for the Proboy study. They also explored the effects of weightlessness in the carotid artery and the redistribution of blood in the upper half of a crew member’s body. 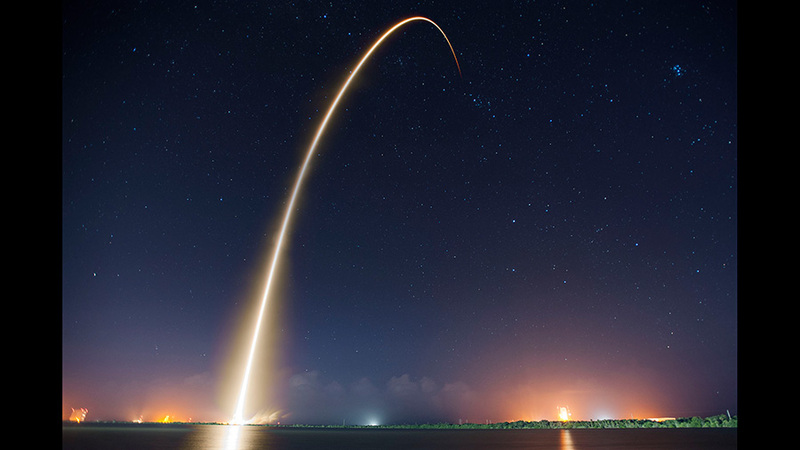 SpaceX will launch the Falcon 9 rocket carrying the SpaceX Dragon cargo craft to the station June 26. It will arrive June 29 to be captured by the Canadarm2 with One-Year crew member Scott Kelly at the controls. Kelly will capture Dragon with the assistance of station commander Gennady Padalka who will monitor Dragon systems before it is berthed to the Harmony Node. 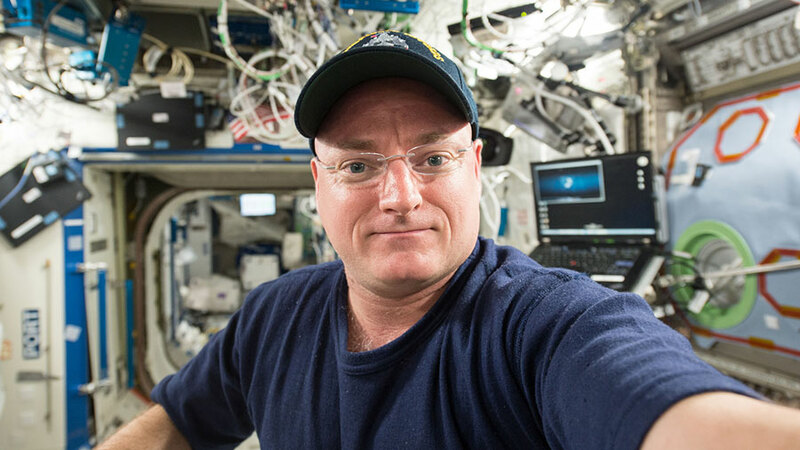 ISS043E279114 (05/30/2015) — NASA Astronaut Scott Kelly works aboard the International Space Station on May 30, 2015 on a number of science experiments and maintenance of the stations equipment. The three residents aboard the International Space Station conducted advanced microgravity science and trained for the arrival of the seventh SpaceX Dragon mission scheduled for the end of the month. One-Year crew members Scott Kelly and Mikhail Kornienko partnered up for the Fine Motor Skills study, part of a suite of yearlong studies planned for the pair. That experiment explores how astronauts operate and repair interactive, touch-based and sensitive technologies in space. Kornienko later studied the possibility of using 3-D manuals, or virtual manuals, to improve training techniques on science hardware. Kelly joined Commander Gennady Padalka in the afternoon for rendezvous training as they prepare for the next SpaceX Dragon launch scheduled for June 26. 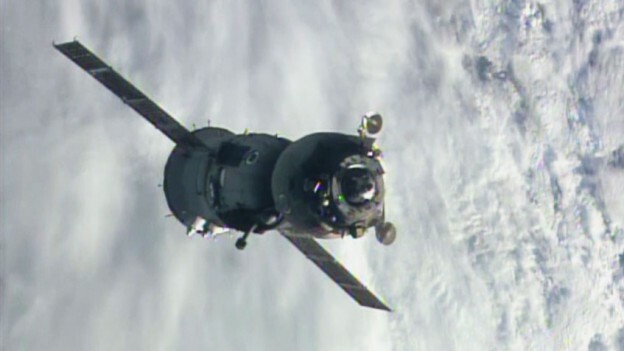 The duo will be in the cupola monitoring Dragon and waiting to capture it with the Canadarm2 when it arrives June 29. 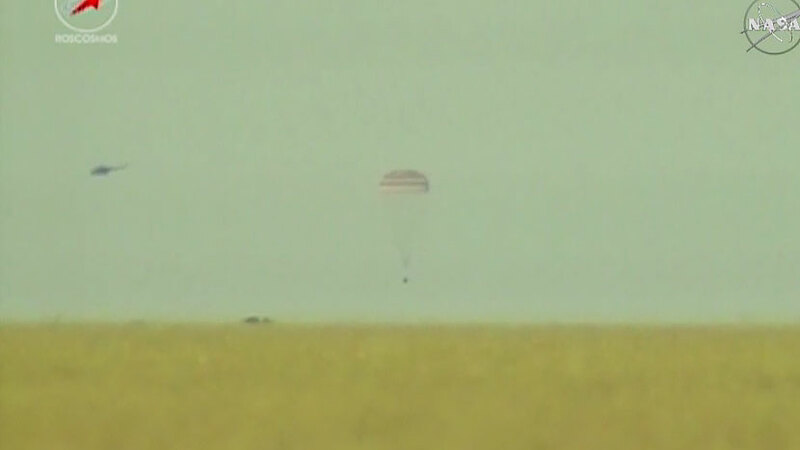 At 3:04 a.m. EDT, the Soyuz hatch closed between the International Space Station and the TMA-15M spacecraft. Expedition 43 crew members Terry Virts of NASA, Samantha Cristoforetti of ESA (European Space Agency) and Anton Shkaplerov of Roscosmos are preparing to undock at 6:20 a.m. NASA Television will air live coverage of undocking beginning at 6 a.m. Watch live at https://www.nasa.gov/nasatv. The deorbit burn is targeted for 8:51 a.m. and will lead to a landing at 9:43 a.m. southeast of Dzhezkazgan in Kazakhstan. 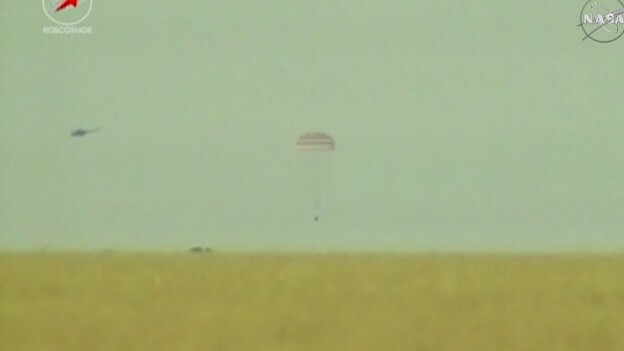 NASA TV coverage of deorbit and landing begins at 8:30 a.m.